MOSCOW (AP) — U.S. Vice President Mike Pence pledged support Tuesday for the former Soviet republic of Georgia, his second stop on a European trip backing nations that feel threatened by Russian aggression. Russia and Georgia fought a brief war in 2008, which lead to two breakaway Georgian regions, South Ossetia and Abkhazia, declaring independence. Russia has since been supporting the regions both financially and militarily. Georgia and the three Baltic nations were all occupied for nearly five decades by Soviet troops before regaining their independence in 1991 after the collapse of the Soviet Union. 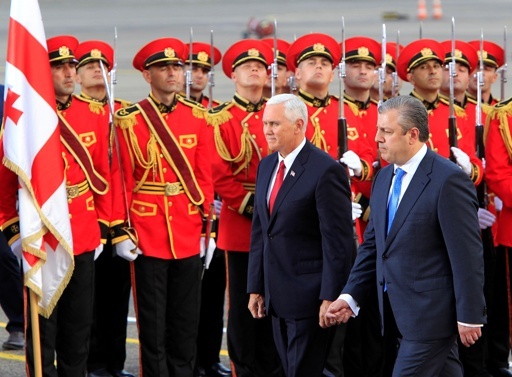 Later on Tuesday Pence will inspect troops taking part in joint U.S.-Georgian military exercises. Pence’s European trip comes several days after the U.S. Senate voted last week to approve the new financial sanctions against Moscow. The legislation bars U.S. President Donald Trump from easing or waiving the penalties on Russia unless Congress agrees. The bill underwent revisions to address concerns voiced by American oil and natural gas companies that sanctions specific to Russia’s energy sector could backfire on them to Moscow’s benefit. U.S. lawmakers said they also made adjustments so the sanctions on Russia’s energy sector didn’t undercut the ability of U.S. allies in Europe to get access to oil and gas resources outside of Russia. Russia on Friday ordered the U.S. Embassy and three U.S. consulates in Russia to drastically cut its personnel there. President Vladimir Putin said on Sunday that means 755 staffers have to go. Russia also ordered to shut down the U.S. Embassy’s recreational compound on the outskirts of Moscow. The Russian leader warned that he has more tricks up his sleeve to hurt the U.S., but he voiced hope that he wouldn’t need to use them. Pence indicated the U.S. was willing to improve ties with Russia but for that to happen “Russia has to change its behavior,” he said, referring to Russia’s support for separatists in eastern Ukraine and for Syrian President Bashar Assad. Russia is planning Zapad 2017 military exercises with 13,000 troops near the Baltic states’ borders in September, a move that may further strain relations.